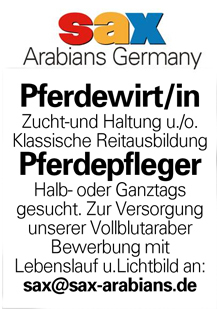 « (Deutsch) Arabische Pferde Jahrgang 2015 – jetzt zugreifen! With Dani El Barbary one of the most passionate horse women of Egypt has died. Emancipated and self-assured, she followed her heart and devoted herself entirely to her horse breeding – not a given thing for a woman in Egypt. Dani El Barbary with her own stallion Waley El Ahd (Beltagi / Set El Hosn II) * 1999 during my visit to Shams Al Asil 2003. As a young woman she became, and learned in several stables in Europe. Horses became her great passion and she was the only female team member of the show jumping team of Egypt in her active riding time. But it was especially the intelligence and inner qualities of the Arabian horse that had done it to her, and sooner or later she found her way into breeding. 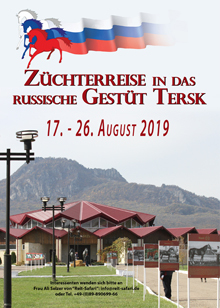 She received valuable advice and help from the then stud manager of El Zahraa, Tibor von Pettkö-Szandtner, but looked also at the other stud farm of the time, Inshass and Hamdan Stables, and in the early 1970s bought a group of young mares who became the foundation of her stud “Shams Al Asil”. Her first stallion was Bilal I (Morafic / Mona) * 1969 from El Zahraa. It cost her two years of persuasion, until Dr. Marsafy let this Morafic son go. But he quickly became her great love and the founding stallion of her stud. He was more akin to the Saklawi type, slender and elegant. A counterpart to this was the later added Misk (Wahag / Nazeema) * 1979, which was strong and compact. The combination of these two stallions was later to characterize the breeding program. According to Tibor of Pettkö-Szandtner’s motto: “No legs, no horse”, she attached great importance to good, correct legs. The mares and their qualities were the most important thing in her breeding selection. She defined the type differently than the modern show ring, whose fashion with regards to type she criticised sometimes hard. 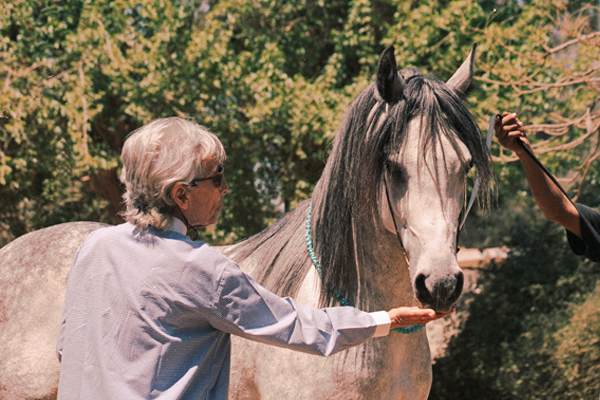 One of the most passionate horsewomen of Egypt is Wegdan El Barbary of Shams El Assil. 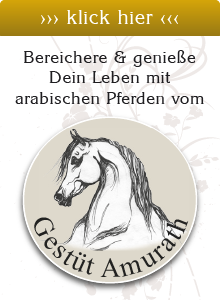 Today in her 80ies, she has been a competition rider in her younger days and a devoted breeder of Arabians for decades. This is testified by the 6th or even 7th generation of Shams El Assil-breeding on the dam’s side, e.g. horses tracing back to the Dahman mare Fanar (Nasralla/Bint Bukra) *1965, purchased from the EAO. 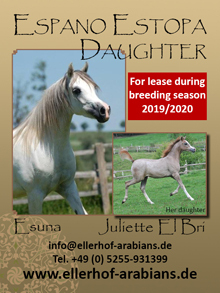 A worthy representative of this line is SEA Solaymah (out of SEA El Hedia) *1990, the last foal of Bilal I.
Bilal I was the head stallion at Shams El Assil for almost 20 years and left many excellent offspring. But he was not only valuable as a breeding stallion, he was also Wegdan El Barbary’s personal favourite. Other important stallions were Misk (Wahag/Nazeema) and his son SEA Sukkar Makoud (out of SEA Farah, a Bilal I daughter). Today, the “Crown Prince” is Waley El Ahd (Beltagi/Set El Hosn II), a stallion with excellent type, a refined face and lots of expression tailing back to the Moniet el Nefous line. Also, the chestnut stallion Ibn Adaweya (Akhtal/Adaweya), bred by the EAO, has been used for many years before he was given to the Rabab Farm and left El Fatah (out of Sharbat) for Shams El Assil, where he had left his first foals before he, too, went to Rabab Farm. 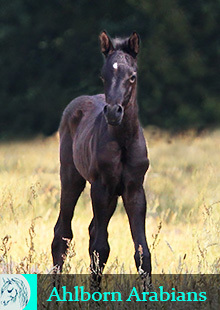 Among the mares the above mentioned SEA Solaymah is of importance, as well as Nirvana (Maleeh/Nadeerah) and her daughter SEA Baghdada (by Sukkar Makoud). Further the EAO mare Meshmeshah (Anas/El Anood) and Set El Hosn II (Karawan/Bahraweyah); Hadban, Saklawi and Dahman lines dominate the broodmare band. At Shams El Assil, the youngsters are given time to develop – yearlings still look like yearlings. They are accustomed to people and only after they turn two years old do they get basic training. Importance is given to a docile yet lively character and the breeding stock is also assessed with regards to the psychological characteristics they pass on to their offspring. Although Dany al Barbary participates in shows, the preparations are not done in the “modern” Western style.